Just a quick observation. There are days when nothing happens. And there are days when I spot Chris March and the Sartorialist, and I buy awesome fresh guacamole from West Side Market. Nice bike. Overall, the look is a bit affected. And no socks with that type of shoe is not very attractive. 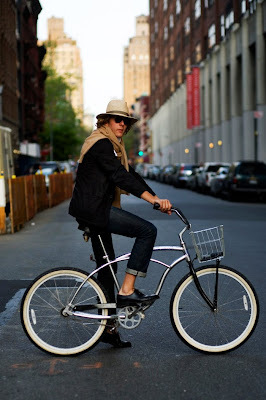 This dude reminds me of that period months ago when everyone was having Owen Wilson spottings around town, as he zipped about on a blue bike and generally tried to assume carefree airs. 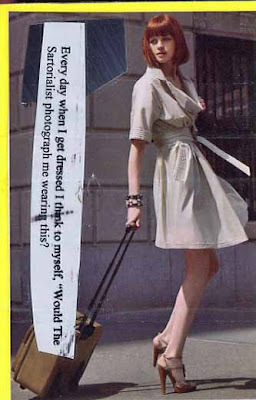 All this is also happening during the week of the Sartorialist's being cut from the GAP campaign AND of the PostSecret card - with which I completely identify: On to today! Taking the train this morning, I noticed something amiss with the sartorial-ness of the guy across from me. There was a HUGE TAG hanging off of his sleeve. I noticed it first, and through the 10-minute ride, I caught the mildly amused glances of others. Who buys a leather jacket just when the weather hits 78 and sunny? A smart man does, because on the flip side of that tag is probably "Clearance $49.99." Check out my hazy cameraphone pics below.